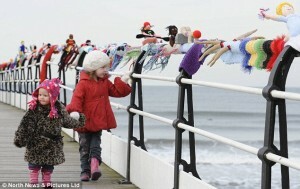 The mysterious graffiti knitters of Saltburn by the Sea had already been at it long before the Jubilee. The inhabitants of the seaside town were already used to finding the little knitted figures and objects that would suddenly appear at various sites around the town. As if this wasn’t magical enough, last March they woke to discover a 50-metre long ‘scarf’ decorating the railings along their famous pier. It sported tiny knitted athletes, representing every Olympic and Paralympic sport, including figures in weenie wheelchairs. Come the Jubilee, the seafront was again adorned, this time with knitted representatives of the Queen and Prince Phillip, together with woolly Corgis, tea sets, crowns and flags. 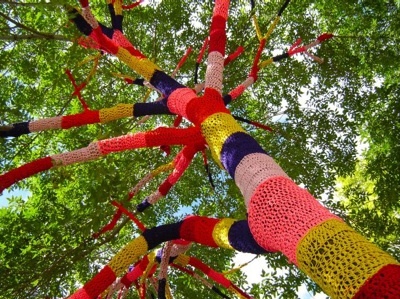 Some call it yarn bombing, others prefer yarn storming or graffiti knitting since this bombardment is far from the images conjured up by the idea of a bomb. Rather it is a gloriously subversive form of graffiti – making you smile and wonder in equal measure. The movement’s beginnings are credited to Magda Sayeg, from Texas. She began in a small, but delightful way. The clothes shop she managed in 2005 stood in a boring, ugly, concrete neighbourhood. Seized by a need to add some colour to her environment, she knitted a door handle for her shop. Inspired, she went on to knit a sheath for the stop sign pole. Such was the interest these provoked that she started to scatter bits of knitting across the world. Over parking meters, a bus, the gun on a statue of a soldier – and so it goes on. 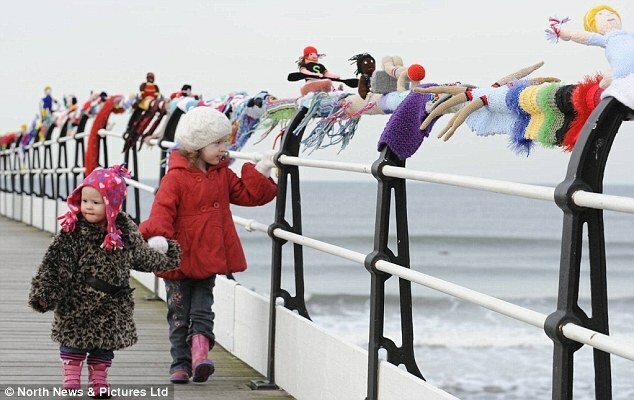 I first came across this inspired movement though the Radio 4 Saturday Live programme, which highlighted the activities at Saltburn by the Sea and instigated a hunt for the mystery knitters. Intrigued, I did some more research and found that in a relatively short time, yarn storming has spread throughout the world. There’s hardly a town or city where you won’t find a tree in a bright stripy jacket, a statue sporting woolly gloves, a drain pipe, a lamppost, a bicycle – even cracks in the pavement filled with multi-colored pearl and plain. 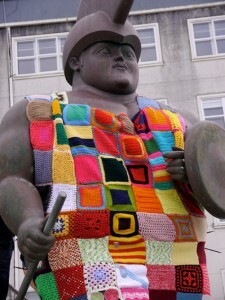 Investigating further, I discovered ArtYarn, a collaborative knitting and crochet project. Formed in 2008 by visual artist Rachael Gwilliam, it brings together local groups and global artists to create stunning, imaginative and cutting edge gallery installations and public arts projects. 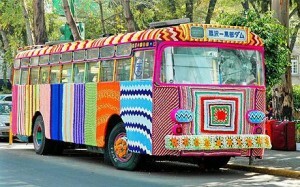 It also instigates creative craft workshops. I also found, to my immense pleasure, the wonderfully named Knit the City and the knitting community, Stitch London with its marvellous slogan ‘Keep calm and carry yarn’. Knit the City was established in 2009 by Lauren O’Farrell, initially to distract herself from the treatment she was receiving for cancer. She got the all clear in 2007 and, with Stitch London, celebrated by knitting a 550 ft. scarf to tie around the lions in Trafalgar Square. 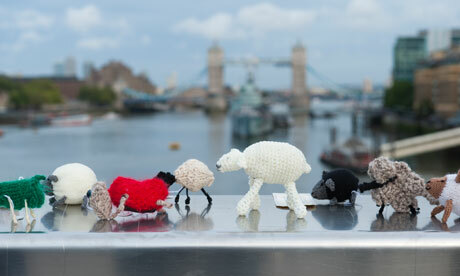 Over the years they’ve tackled projects as diverse as phone box covers, installing a 13ft spider’s web, replete with trapped insects and fairies, in the “graffiti tunnel” beneath Waterloo station, driven a handmade herd of sheep over London Bridge, and installed a white rabbit on the South Bank. If you love things that are different, beautiful, kooky, weird and wonderful or a combination of all these, Google ‘yarn storming’, ‘graffiti knitting’ or ‘images for graffiti knitting’. Or click any of the links in this post. Then sit back and prepare to be amazed. For all the dark and nasty stuff in the world, aren’t we lucky that there also exist such creative, imaginative, eccentric and delightful people. Long may they continue to add colour and pleasure to our world.